The crisis in Libya has crude oil prices soaring, peaking this week at more than $103 dollars a barrel. And, according to AAA, the average cost of a gallon of regular unleaded gasoline in the U.S. is now $3.29, up nearly 12 cents in just the past four days. 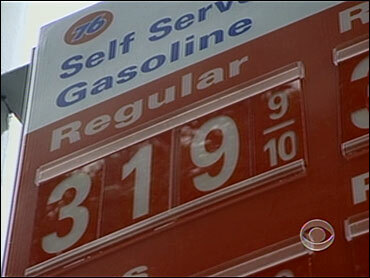 Some experts say it could hit $5 a gallon by summer. But, as AOL Travel Executive Editor Jason Cochran explained on "The Early Show on Saturday Morning," there are ways you can make sure you're paying as little as possible for gas. Cochran, who's also editor at large of AOL's Walletpop.com, said websites are "the first place you should turn when you want to find some cheap gas. There's one that we like called GasBuddy.com. This is a place that kind of keeps track of industry trends, tells you why prices are going up, what to look out for. Has a heat map of where things are cheapest or most expensive. Also will tell you an estimation of your costs based on your car and your mileage. So it's a good place to start. Provides a lot of prices. ... You can look by zip code pretty much ahead of time before you go. "Another one I like is Mapquest. They actually have a gas prices section of Mapquest. A lot of people don't realize it. It's Gasprices.Mapquest.Com. It can actually (enable) you to plan your journey and figure out where the gas is gonna be cheapest as you go. Because you don't always know the zip code of where you are, for example, if you're on a road trip. This will let you plan it out ahead of time" so you can figure out where to go, as you go." Co-anchor Rebecca Jarvis pointed out you could even use it if you have a long commute to work. "(The source of less costly gas) might have been closer than you thought it was," Cochran agreed. "It might have been just a little bit away, a block or two off." Both those website have their own, free apps to help you locate cheap gas. But Cochran recommends "getting a lot of apps in this category. Simply because there's no one place to get the best gas pricing information. A lot of times, users send it in. So you need to have a bunch. "Cheap Gas! is a good one. It's free. It will sort where the gas is by distance or by price. It will also tell you how old the number is. So, if it's six or seven days old, prices have shot up in a few days. You need to know how old the number is before you go." Another app Cochran speaks highly of is FuelFinder. "That one's $2.99m" he says. " For the extra money, you find out about the gas station itself, whether there's a car wash or a shop. You can find out an estimated time to get to that gas station. So, if you're really running on fumes, you know it's not a good idea to try to head across town for that cheap stuff." What about paying with cash, as opposed to credit cards? For the mom-and-pop gas stations," Cochran replied, "often, they have some cheap gas, cash might be the way to go. There are some places that charge you just a little bit more or a little bit less, depending on whether you pay cash or credit card. I'm a kind of a cash guy. Just because I don't like working off my credit cards in my life. And as prices rise, you don't want to go into debt over your gas. " What types of gas stations should people consider steering clear of? "I would not necessarily choose the ones right on the main highway or the main way to work. Sometimes the cheapest gas is on the side roads. So, the high traffic areas (are) the ones you probably want to think twice about. They may not need to lower the price. " "Some wholesale clubs, it's called a loss leader. They're willing to cut the price on something to get you on the premises. Gas is one of those things. If you have a rewards card and you pay in cash you could get a discount. Or you could get 10 percent off if you buy groceries at the same place. You may not know about it, so make sure you ask. We're talking the big box stores here now. " Cochran also mentioned what's been dubbed van pooling. "This is kind of an old trend that's become new again," he said. "Carpooling, everyone knows is a great way to save money on gas. But vanpooling is sort of a new concept. You get about 7 to 15 people per van, average cost about $120 a month or so, and that's all in(cluded), including maintenance of the van. And there are companies that will set up employers with a van pool, so people can actually take advantage of this. I know there's a site called Van-pools.com that people use. And it will set you up. They estimate they save their clients, I think, about $95 million in gas last year. And that's just 5,000 or so vans." After all is said and done, Jarvis asked, how can you know whether it's worth it to drive a little further for cheaper gas? Bankrate.com offers a tool to figure it out, Cochran observed. "You can search for it. If you put in Bankrate, cheap gas in Google, it will pop up. Say our gas tank is about 12 gallons capacity and we get about 24 miles per gallon. You put all the numbers in of what the price is there and the price is here, you'll find out, would it be saving money to go, would it cost me money to go? Because sometimes, it does cost you money to go across town to get extra gas." Cochran added a bit of overall advice: "Don't get too obsessive about this. There's lots of information. You could go crazy. Frankly, you should just sort of look within your radius for the cheapest stuff. "